Lovely 2bdrm, 2bath Unit With Multiple Ocean Views, Gorgeous Ocean On 3 Sides! - Gorgeous Delaporte Bay Beach ... located at the end of world-famous Cable beach .... honestly, this stretch of beach is one of Bahamas best kept secrets! Its awesome, and private/quiet! Great snorkling all alround the Delaporte Point and into adjacent Delporte Bay. - Two private ocean-side pools, tanning & shaded areas .... quiet ... and no having to fight other tourists for a lounge chair!! - Close to everything; Beaches, activities, restaurants/bars, groceries, banks, liquor stores, gym, medical, etc. This doesnt mean 'over commercialized' though ... the area has a great Bahamian feel to it, whilst providing access to these conveniences. Its truly a perfect combination. - 10km from downtown Nassau, 5 minutes from the airport (but flight paths dont cross near/over the property!). You wont waste your [valuable] vacation time commuting to/from the airport! 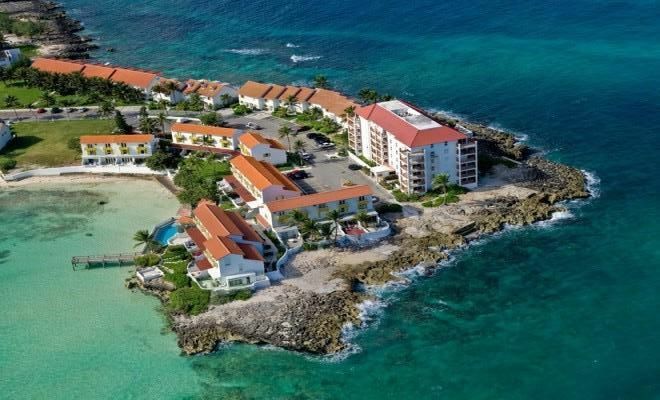 WELCOME TO DELAPORTE POINT, NASSAU'S BEST VACATION LOCATION! My wife & I are owners and users of this fantastic apartment. We work very hard at keeping it in top condition. This property is uniquely located on a small peninsula, very likely one of the best locations in the Bahamas! Laundry room located in lower level of condo building. Tokens can be purchased for $3.50 form office manager. We absolutely loved Tina and Erik’s condo in Delaporte point. They were so great to us and we will definitely be coming back. The condo was beautifully decorated and had everything we needed. From beach towels, plenty of bathroom towels, beach toys, extra pillows and blankets to extra garbage bags and paper towels, they truly go out of their way to make your stay comfortable. The only reason we didn’t give the unit 5 stars is because the beds were pretty uncomfortable. Tina, however, definitely gets 5 stars as a host. She was very understanding and accommodating when our flights were canceled and we twice had to change dates! The location was very ideal. We were close enough to everything we needed and far enough from the cruise ship traffic. We loved walking over to the Poop Deck for dinner or just spending the day on the beach where they have beach service. Wonderful vacation! Thank you Tina and Erik!! The property is taken care. Easy access to beach and pool. Beautifully equipped in the perfect spot. The condo is perfect. It had everything you needed and more. The water views are beautiful, quiet and serene. The snorkelling was great right in front of the condo. Everything is a bus ride away if needed, groceries, down town, restaurants. Our hosts were great to deal with and any issues were quickly addressed. This is our 3rd time staying here and we'll be back for sure! Everything was as promised. Unit well appointed and very cozy. Location is great, close to services yet out of the tourist area. We had some great meals at the Blue Sail, Poop Deck, Spritz... also recommend the food & rum tour downtown. Shout out to M&M Seafood in Potters Cay - great food (best fries anywhere!) and owners helped us buy some fresh grouper off a boat to take back to the condo to cook and filleted it for us. All the locals we encountered were very friendly and helpful. Owner very good in keeping in contact... even with our move across the country and change of email address leading up to trip. Thank you Tina & Erik. We would highly recommend this location. This place was nice. It was very clean and very quiet. It came exactly as advertised. Tina was a very good host. She answered our questions promptly and provided an excellent info package with tips, maps and restaurant and activity suggestions. The two pools onsite were nice and we were minutes away from a nice beach. A ten minute walk across the bridge and into Sandyport we found the Twisted Lime restaurant. Good food and reasonable. A fifteen minute walk brought us to the Supervalue grocery store and Marcos pizza ( which we really enjoyed ). If we return to Nassau we would stay here again.